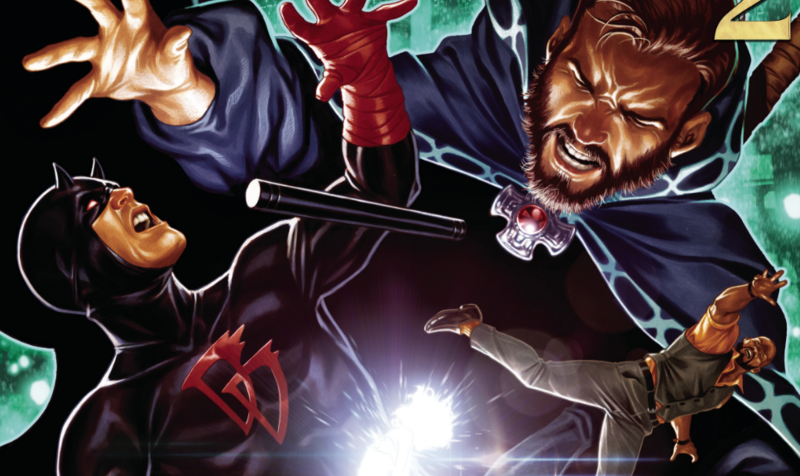 Secret Empire #2 Review – AiPT! 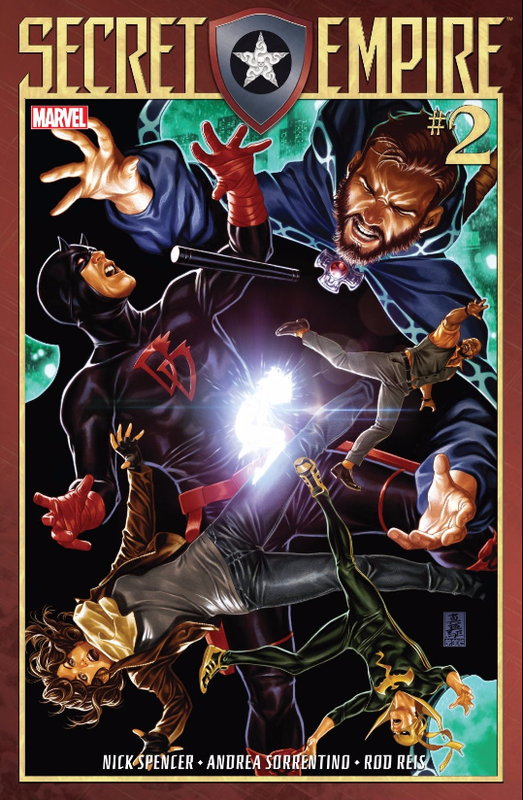 The second issue and technically the third chapter in the Secret Empire series is out today. Given the cover (and preview) we’re going to get some major details about what happened to the huge group of heroes who were sent to the Darkforce Dimension. With Cap and Hydra pretty much winning and ruling everything, it’s a great time to check in on the heroes! It’s the second issue in the big Marvel summer event. Nuff said? Okay, it’s also a series Nick Spencer has been writing towards for months, if not years now (if you include “Pleasant Hill”) which means we’re getting the finale of his master strokes. It’s also drawn by Andrea Sorrentino who is a master at dark and atmospheric work. Black Widow steals the show in this issue. There is a lot going on in this issue even though it’s only running at 26 pages of story content. Focusing mostly on the heroes’ side of things, Spencer does a good job establishing where the heroes are at as well as giving them new direction. In a sense, this issue is more of an introduction to what we’re in for as far as the journey of our characters go than the previous two. Those were great at setting up the stakes and scenario, but the characters still didn’t have much purpose. Until now. That’s partly due to the McGuffin being revealed (so glad that wasn’t dragged out) as well as a general idea of what the heroes can do to dig themselves out. Ultimately there isn’t a lot of punching or fighting going on in this issue, but due to Andrea Sorrentino’s awesome art style there doesn’t need to be. Opening in the Darkforce Dimension, Sorrentino drops Luke Cage and Iron Fist in a very creepy and almost horror movie style scenario. Soon we learn all the heroes in this dimension are in a horror scenario themselves, which gives the book a decidedly different flavor. Past events have certainly thrust the heroes into impossible situations, but Spencer is leaving them with nearly no room for escape, which certainly raises the stakes and makes for an exciting series. Though the characters have some hope, Spencer has certainly created a puzzle box here that’s yet to reveal how the heroes can ever achieve. That’s exciting since most events have some semblance of escape. As the issue progresses you get key character moments, particularly with Black Widow, that do well to capture the psychosis of the characters. A surprise appearance by a once dead character is a highlight, which includes as a fantastic mosaic double page spread by Sorrentino that’s the perfect “Where are we now” setup page. It’s pretty clear who the main heroes are going forward, Tony Stark’s AI included, and a key scene with Cap is included in that bunch of interesting character work scenes. All in all, Spencer is doing a fantastic job supplying the emotional grit of the characters to hang the big plot elements on. Sorrentino draws his pants off in this issue. More than once I audibly said, “Wow” and there are a few panels that’ll force you to linger to grasp the complexity he’s instilled on the page. His colors have a washed out look at times that imbue a sense of disrepair that’s perfect for the heroes’ side of things. Meanwhile, Hydra scenes are cast in reds and shadow conveying a great sense of evil intention. If the character work wasn’t so deep you could probably read this without any words and still grasp the mood and tone of the story. There’s a lot of expressive art in this issue. Facing facts, this is a table setting issue, though it’s a necessary one, given we’ve been in the dark concerning the heroes for some time. That said, it’s biding its time to deliver a lot of facts, which can make the read feel slow. There’s also a whopper of a cliffhanger that has zero context which will piss off readers. It irked me quite a bit, but I’m giving Spencer the benefit of the doubt that it’s not a cheap deus ex machina trick. Moody, dark and atmospheric, Secret Empire has an eclectic identity that’s exciting and filled with surprises. The heroes’ story is fleshed out in this issue in a variety of ways that are interesting and set the stage for what could be an event we’ll never forget. A strong second issue that serves as more of an intro as to what's to come for our heroes than either of the previous issues.